Mattew Yglesias has an interesting post looking at popular support for various people and topics. He points out that support for marijuana legalization is considered a "fringe" view in national politics. But compared to what? 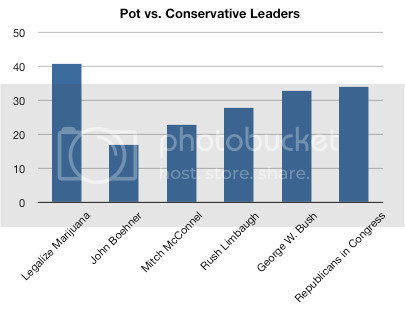 A lot more people support legalization of marijuana than support George W. Bush or Republican congressmen -- never mind Rush Limbaugh. If you reframed this in terms of "regulation" of marijuana or something that doesn't imply completely uncontrolled distribution, I think you'd find majority support for it. Last night right before I fell asleep I watched a TV news show showing a stream of red-faced white guys in suits expressing outrage over the number of people who use marijuana or make money in the pot industry. ""It's illegal!" they said, but they never gave any explanation for what is wrong with it. Are they really that worked up because it's illegal? What do they do when they see somebody jaywalking, I wonder? The main problem with marijuana is that it's against the law. It's illegal because it's illegal, there's nothing more to it. As far as these conservative loudmouths, the fact is that American people don't like them. It's fine for people to believe that their "way of life" is better than other people's, but other people aren't likely to agree with them. The comments at Yglesias' blog are interesting. Like, somebody notes that modern conservatism is fringe politics with no medicinal benefits -- pretty good! Aunt Bea -- A Washington Post/ABC poll of this nature is equivalent to a Teach the Facts/Equality Maryland poll about whether they like the gender identity bill. It's biased right out of the gate. "they'd rather cut rich people's and corporation's taxes some more, like we have for the past eight years, and call it the "GOP alternative stimulus package""
It's worked for the last quarter century. Why wouldn't it now? The stock market's been falling since Obama's stimulus plan was announced. The stock market's now at a level unseen since Bill Clinton's administration. It's biased right out of the gate. "...Americans put far more faith in Obama than in congressional Republicans: Sixty-one percent said they trust Obama more than the GOP on economic matters; 26 percent side with the Republicans in Congress. On that question, Obama's advantage is bigger than George W. Bush, Bill Clinton or George H.W. Bush ever had over the opposition party in the legislature. barryo told the half-truth The stock market's been falling since Obama's stimulus plan was announced. That's partially true but the full truth is that the stock market's been falling a lot longer than that. It started it's precipitous fall under Bush/Cheney. Coincidence? Check out the graph of the Dow Jones Industrial Average, which you might have seen before if you read more than just the commentary pages at the Post and WSJ. You'll notice the precipitous fall began well before Obama offered his stimulus plan. You'll also notice that all of the money Bush/Cheney and their 2006 pick for Treasury Secretary, Hank Paulson threw willy nilly at various firms last year did not change the downward course in any significant way. Obama's targeted stimuli will need time to alter that steeply declining course Bush/Cheney left us on. Continuing their disastrous policies are not an option. Regarding attacking the sources of a poll..a poll, Bea, is ALL ABOUT the source. There is no other distinguishing feature as important as the "source" when it comes to a poll. If an association for accountants polls a bunch of accountants and determines that "most people like to do other people's taxes", would you believe that the poll applies to the general population? No, you would say that the poll is biased toward people who already like numbers. The source, in the case of a poll, is EVERYTHING. The Washington Post/ABC poll simply tells us that liberals like the stimulus plan. Also, in the LA Times this morning, they reported that Obama's approval rating has slipped about 10% which, they say, is average amongst presidents in the first month. However, they also said that his disapproval rating is 24%, which is 10% higher than the average disapproval rating. There is no other distinguishing feature as important as the "source" when it comes to a poll. No, the methodology is the most distinguishing feature. This poll was "conducted by telephone Feb. 19-22, 2009, among a random national sample of 1,001 adults including landline and cell phone-only respondents. The results from the full survey have a margin of sampling error of plus or minus three percentage points. Sampling, data collection and tabulation by TNS of Horsham, Pa."
The Washington Post/ABC poll simply tells us that liberals like the stimulus plan. OK so does that mean FOX polls only tell us what conservatives like? It's must be big news then that they found very similar results as the Washington Post/ABC poll did. And it's not just FOX that agrees. All the recent polls are pretty much reporting the same thing. they also said that his disapproval rating is 24%, which is 10% higher than the average disapproval rating. Maybe that's because 60% of the GOP is marching in lockstep with their "inconsequential" Congressional leaders. "I don't even know the congressional leadership," [GOP] Gov. Jon Huntsman Jr. told editors and reporters at The Washington Times, shrugging off questions about top congressional Republicans, including House Minority Leader John A. Boehner of Ohio and Senate Minority Leader Mitch McConnell of Kentucky. "I have not met them. I don't listen or read whatever it is they say because it is inconsequential - completely." It's worked for the last quarter century. Do you really think that all we've done in the past 25 years, since 1984, has been to cut taxes? Every President regardless of party for the past 25 years has raised at least some taxes. Check it out. In 1984, Reagan signed another big tax increase [his third] in the Deficit Reduction Act. This raised taxes by $18 billion per year or 0.4 percent of GDP. A similar-sized tax increase today  would be about $44 billion. The year 1988 appears to be the only year of the Reagan presidency, other than the first, in which taxes were not raised legislatively. And we all remember what happened to BushDaddy's Read my lips: no more taxes pledge.